Hey ya'll! 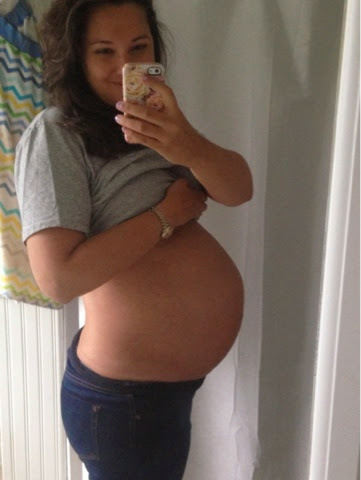 I'm still pregnant and I thought you might want to see what my belly looks like at 9 months pregnant. Let's face it, I'm super nosey and I always want to know what people's bellies end up looking like after they have a giant human inside of them. So here it is: a completely unedited, super un glam bathroom selfie. Symptoms: incredible rib pain, no sleep at night, a big belly with a big breech baby in it. Loving: still loving lemonade, lots of pillows, Pepsi in baby cans, being able to leave the house, that Justin has next week off! Loathing: stranger comments about how I must be due any day. Um, technically, I'm not, Not even close. So shut it stranger people. Husband: is ready to meet our baby! And to have a week off next week! Maternity Clothes: still mixing and matching! Best Part of the Week: I hope it's tomorrow when they tell me I've dilated another centimeter and I can have him! Worst Part of the Week: honestly, last night was the most painful of my pregnancy (including my nights in the hospital). Love your super "un-glam" photo and you still look amazing!!! Hope the pain eases up for you a bit! Girl you look AMAZING!! Look at that pretty baby! I may have to follow in your footsteps and go bare belly one of these days. Lord knows after the baby comes bare belly photos will not be shown! Can't wait for his arrival!! So cute! :) I can only imagine how ready you really are! You look amazing! Almost there mama! Hope the pain eases and you get some good news from the doctor!